Schmincke Pastel Primer provides a semi rough surface that is absorbent and good for blending. The primer itself is a light grey colour, however it can be tinted with any acrylic ink or paint which allows you to create any background colour you wish. 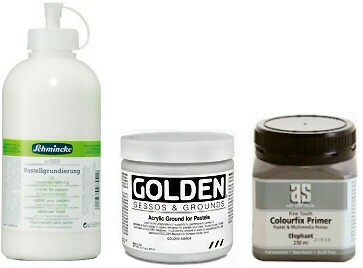 Golden also provide a very good quality pastel primer which can also be coloured with any acrylic ink or paint to create the perfect background for your artwork. The Colourfix primer provides the same surface that is on the Colourfix paper and boards. It comes in a range of 20 colours.